For its interest and for yours, we have reported on this story. A young man from Fairfield University tried to break up with the wrong woman. She lost control and assaulted him. She is now being charged with third degree assault. This will show you how dangerous some women can be. 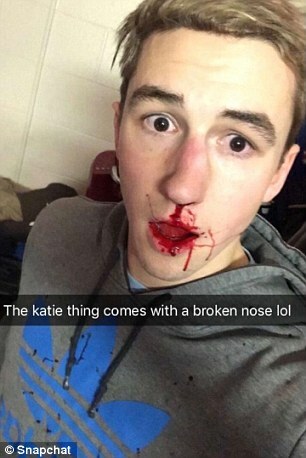 After cleaning up a bit, the victim, Ben Kebbell showed off his broken nose. When reporting the story a couple of days ago, I only showed the perp, Kathryn Mahoney, in her mugshot. In truth, it was not her best angle. The below image shows her to better advantage. It leads one to imagine that she has not had very much experience with men breaking up with her. Should that be "now being charged" instead of "not being charged?" Yes, thank you... correction made. "It leads one to imagine that she has not had very much experience with men breaking up with her." Got to agree most heartily with you on that! Does one really think this woman had to develop a personality? Odds are her looks got her everything she wanted and the power to play men for fools. She did the dumping. She was not the one who got dumped. I would bet he probably beat her to the "dump" and that is what made her mad. In general men get rejection and not the other way around. And one wonders why men don't call back? One does not hear too much about the growing numbers of women who commit violence on men because the police almost never believe them, their friends almost never believe them and society degrades them if they have the temerity to say anything. If men go to protect themselves they are almost always accused of attacking the women who were the perpetrators of the violence in the first place. What is the canard that is prevalent now? "Women have to be believed and they never lie." Difficult to protect yourself from odds like that. This is a case where men's supposed advantage is largely a disadvantage. The culture largely tells women that violence agains't men is perfectly acceptable. One only has to look at the loss of "due process" that many men have suffered and the attack on menthol is prevalent on most academic institutions. The ones I feel sorry for are the boys who have to grow up in a society that wants to believe they are expendable. "attack of men that is prevalent" Damn spell checker got me again. Wow, pictorially I find the case even less compelling than originally, and it looks more like two drama queens than one. 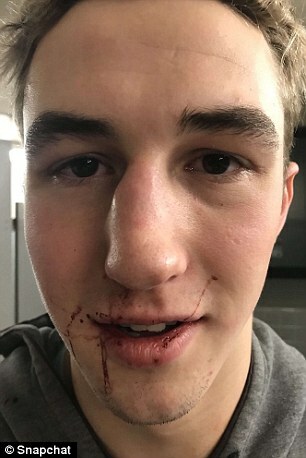 I might take a picture of myself in such a case, before washing my face just in case there was complete denial, but it takes a certain kind of person to share his own humiliation to the world, just in case it hurts the reputation of his bad-tempered bully more than himself. Someone is going to have to write up a book that teaches people how to be provocateurs and how playing the victim gains themselves status and power in the modern social media word. I don't plan to read it, but perhaps it would help a few people identify why they should practice being provoked and insulted until their reptilian brain is no longer triggered. The real devious devils in the world might be those who can smile when you break their nose, knowing they've got you right where they want you.